Our product range includes a wide range of Packaging Machinery such as Sauce Filling Machine, Ginger & Garlic Paste Packaging Machine, Automatic Pouch Packing Machine, Pouch Filling Machine, FFS Packaging Machine, Chikki Packing Machine and many more items. 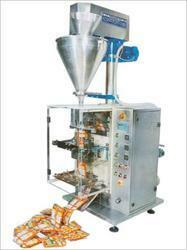 We are involved in the business of offering high quality range of Sauce Filling Machine. 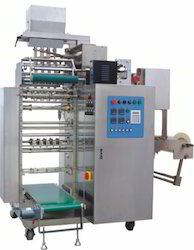 Our offered Sauce Filling Machine is obtained using the high grade of raw material in compliance with the latest manufacturing techniques. Our ranges of products are stringently test, throughout the processing, which increase their durability and reliability. Our products ranges are widely demanded in the market due to their superior performance. Empowered by a technologically-advanced infrastructural facility, we bring forth a premium quality range of ginger garlic paste packaging machine. Widely used by domestic industries and international clients, these are well known for their features of high tensile strength and durability. Leveraging on our technical expertise, we are able to manufacture and supply a wide range of pouch packaging machines. Our team of professionals especially engineers these packaging machines using cutthroat technology and quality-tested materials. 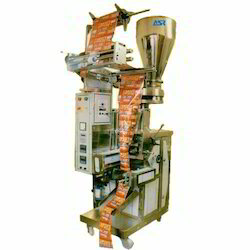 Entire range of packaging machines for pouch complies with international quality standards. Pouch packaging machines delivers consistent performance by consuming less energy. Our array of pouch packaging machines is widely acclaimed for their unique quality features such as compact design, robustness and durability. Packaging machines for pouches are available with customized design. Our clients can easily install and maintain our pouch packaging machines efficiently. The use of high quality materials in packaging ensure for defect free transportation of packaging machines. We avail our pouch packaging machines in the markets at the industry leading prices..
With the help of the experienced engineers, we have been able to design and developPouch Filling Machine. The offered packing machines adopt compound film as packing material, which is applicable for automatic soft packing for wine, sauce, cooking oil and vinegar. These machines help the customers to carry whole flow of making bags, sealing, quantificational filling and cutting. We have with us extensive experience in successfully handling the demands of precision engineered FFS (Form Filling Sealing) machines Coming with option of inserting the packaging media into machine through model film folding system, the process ensures wrinkle free pouch formation. 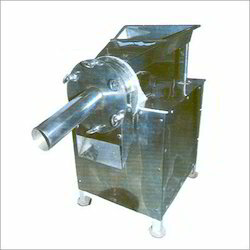 We offer Chikki packing Machineries that are used for Packing various chikki & namkeens as well. This machine is installed under hygienic conditions and is also easy to operate as well as function efficiently. We are among the prestigious names in the industry, engaged in offering Idli Dosa Flour Filing Machine to our valuable customers. The offered filing machines are meticulously designed and are characterized by piston filing system, optimum filing accuracy and a compact design. These lightweight machines are easy to install and provide long-term service to the customers. Dates bar chocolate is in great demand for its health properties and delectable taste. Under the comprehensive category of flow wrap machines we design and manufacture dates bar packaging machine that comes under the broad category of flow wrap machines. These flow wrap dates bar packaging machines are available with auto / manual feeder for convenient operations & enables quick change over. These food packaging machines have a capacity range from 120-400 packs/min with the dimension of 3700mm length, 1200mm width, and 1800mm height. These precision engineered and hardwearing dates packaging machines have electro-mechanical drive and are suitable for all types of heat sealable films and laminates. The machines are able to provide center seals made of heat sealable laminated polyester or B. O. P. P film. The Pencil packing machine has internal drives that has the power to perform packing at higher frequency. 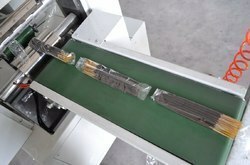 The machine gives flexibility of packaging the pencils in boards or plastic bags. The Ballpoint Pen Packaging machine is ready engineered for perfection in packaging. In collaboration with stationery manufacturers across India and Globally we have developed a product that packages ballpoint perfectly in lesser time. It also ensures that there are no mishaps like ink spillover while packaging. Sketch Pen Packaging is done in thick material plastics, handling which is a challenge during packaging process. Zigma machinery is perfected in handling both the packaged and packaging material with perfection. We design and manufacture and supply a comprehensive variety of horizontal flow Tamarind Bar Packaging Machine. High technology used in the manufacturing process permits the machine to wrap tamarind and other fruit bars in most efficient manner. These highly sophisticated Tamarind bar packaging machines have electro-mechanical drive and are suitable for all types of heat sealable films and laminates. 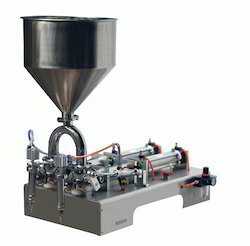 The Test Tube Packaging machine facilitates instant automated filling of test tube. Thus a lot of time is saved from trying to do manual test tube filling and similar product packaging requirements. The machine is engineered perfectly to the varying requirements concerning packaging of tube and vial, tube only and vial only. The machine allows packaging of these items in transport carousel, dispenses, tight caps tubes and plastic films. The machine has certain distinct features such conveniently modelled pallets, external aluminum frames, servo-motors, combined circuit boards and controls . The manufacturing technique makes the machine flexible for the manufacturing of drug and pharmaceutical packaging machinery including aseptic fluid handling blow/fill/seal packaging machinery for the pharmaceutical, personal care,diagnostic, respiratory therapy, ophthalmic, veterinary, biologics & nutraceutical markets. The Facial Mask Packaging machine has Dual motors and transducer control, besides an additional PLC controller, adjustable bag length cutting, operational assistance saving time and films. Also the machine has an auto failure fix function and clear error display thus helping troubleshoot any problems you may encounter while packaging. The facial mask packaging machine helps achieve air tight packaging without any problems. The machine adjust to packaging different quantities of facial masks. These efficient and hard wearing machines have electro-mechanical drive and are suitable for all types of hollow pin chain packaging. The machine is resistant to friction and can bear heavy loads. It is designed to give maximum packaging frequency in the least amount of time. The hollow pin chain packaging machine is a premiere machine that does not wear out with time. These efficient and hard wearing machines have electro-mechanical drive and are suitable for all types of Bearing packaging. The machine is resistant to friction and can bear heavy loads. It is designed to give maximum packaging frequency in the least amount of time. The Bearing packaging machine is a premiere machine that does not wear out with time. The Door Magnetic Catcher packing is done by precisely modeled Door Magnetic Catcher Packaging Machine. The superior internal machinery ensures extended performance and proper handling of magnetic door catcher. It ensures that the product is packaged moisture free that makes it safe for transportation. The Door Magnetic Stoppers are heavy steel or metal products installed in doors. The packaging machine is designed in a sturdy format so as to handle the magnetic stopper packaging in a more productive manner. The packaging machine is designed from inputs by manufacturers of door magnetic stoppers. Thus we are able to make a product that has higher productivity and meets your challenges. We are manufacturing the right packaging solutions for the hardware industry. We achieve perfection by working closely with the hardware product manufacturers in understanding their specific requirements. The high power lock packaging machine performs packaging of locks at a higher frequency and does so with accuracy. Extreme precaution is taken for the packaging of intravenous fluids since they have a large capacity to react. The IV Fluid Packaging machinery ensures a smooth packaging such that there is no possibility of external contamination or internal damage due to excessive tight packaging. 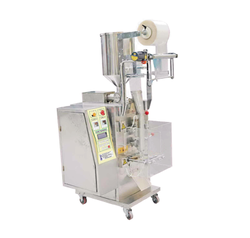 The machine is a semi-automated rotary, reciprocating motion, 8-station machine, suited for filling and capping bags of various capacities and materials. The mosquito coil packaging machinery supports all types of packaging like B.O.P.P, LD Polyester, Aluminum Foiled etc. in pillow packs. The machine serves medium - to high - production automated non- shrink- packaging solutions for the mosquito coils used widely in the FMCG industry. The sealed packaging performed by the machine helps retain its quality and properties. The Machine is fitted with electronic motion control and an ergonomic design that makes cleaning and sanitizing easier. The machine has high quality servo controls that helps make size changes and generates lesser noise. The Soap Packaging machinery ensures added operator safety with its trusted imported instrumentation manufacturing. The soap packaging machinery adjusts itself to washing bar packaging and detergents packaging also. It also gives the operator effortless height adjustment of cutoff unit and discharge conveyor and ensuring tighter packaging through gripped discharge conveyor. The incense stick packaging machine serves features like automatic feeding, metering, bagging, filling, and sealing, printing date, output and a series of automatic functions. The machine has flexible feeder that adjusts to different materials on different feeder facilitating meeting of specific requirements across various industries. It allows packaging through any of these materials like polyester composite film, polyester film / polyester composite membrane, nylon membrane / polyester film composite, polyester film / aluminum foil composite pure polyester film and other similar materials. We design and manufacture Horizontal Flow Stick Ice Cream Packaging Machine that has all the attributes of a good horizontal flow pack machine. The machine is fitted with electronic motion control and an ergonomic design that makes cleaning and sanitizing easier. The Horizontal Flow stick ice cream packaging machine has adjustable film folding box, LCD display and numeric keyboard, provides ease in setting machine parameters, and it displays operational and error messages. All these features make most efficient and lasting packaging that helps in retaining the correct temperature of the ice creams. Our packing machine is broadly acclaimed for its high quality & long life. The material used for the designing of this packing machine is inspected on various parameters in order to supply flawless range from our side. The offered packing machine is provided in various specifications. Our customers can take this packing machine at very affordable rates from us.